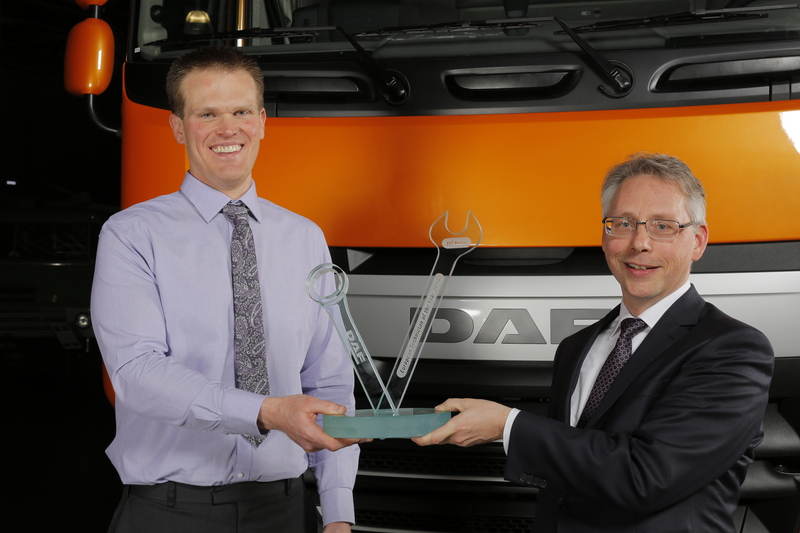 Adam Baker best DAF technician in Europe - DAF Trucks N.V.
Picture: Johan Drenth, After Sales Director of DAF Trucks N.V. (right) presented the trophy to a very happy Adam Baker. During the European final, the sixteen finalists demonstrated their skills in several theoretical and practical cases in which they had to solve complex malfunctions on engine and vehicle systems. compete against each other during the European final. Adam Baker - who has worked for six years at the Chassis Cab Truck Centre dealership in Ipswich - was completely surprised by his victory. "I could hardly believe it when I was chosen as the best DAF Technician in Britain last year," he says. "And now I'm the best in Europe!" What in his view characterizes a good technician? His answer is short but clear: "An in-depth, all-round product knowledge. And above all, a lot of dedication."